The iconic Grand Central Terminal is a building with more than a few secrets. Constructed in 1913 with the wealth of the Vanderbilt family, there was a lavish private office (now known as The Campbell Apartment), glass catwalks, a hidden spiral staircase, and even artists’ studios on an upper floor. One of the most infamous secrets of the terminal, however, was a secret track used specifically for a president to access one of the most famous hotels in the world. Known as Track 61, it leads to a special platform that was never used or intended to be used in regular passenger service—it just happened to be in the right place. While the subway can always be a bit creepy, there might be more behind those spooky feelings when standing underground than just frighteningly bad service. 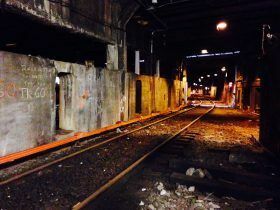 Allegedly, a ghost haunts Track 61, the secret track hidden under Grand Central Terminal, according to Phil Schoenberg, a New York City historian and founder of Ghost Walks NYC. 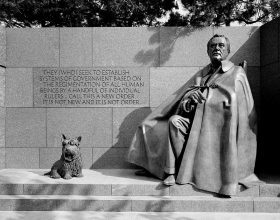 And not just any ghost, but the spirit of President Franklin Delano Roosevelt’s Scottish Terrier, Fala, who apparently roams the shuttered train track. The president famously used the private track as a way to escape the public eye, keeping his paralysis a secret (h/t WNYC).